Sean Connery’s light grey mohair suit from Dr. No was previously covered here, but it shared a post with another suit in the same cut with the same details. Since this suit is currently seasonable in the northern hemisphere, here is a closer look at it. A blend of mohair and wool is one of the best suitings for dressing up in hot weather. Mohair is a stiff fibre from the Angora goat that when added to wool gives it a stiffness to help it wear cool and resist wrinkles and a dressy sheen. Mohair even resists wrinkling in light weights, which helps it perform exceedingly well in hot weather. Mohair is almost always blended with wool rather than worn on its own because alone it is too stiff and does not drape well. The amount of mohair in a wool blend often ranges from 15% to 40% to temper stiffness and sheen, but any ratio of mohair to wool is possible, as are blends of mohair with other fibres like cashmere and silk. James Bond wears a silvery grey mohair and wool suit for scenes at Puss-Feller’s club in Jamaica in both the daytime and the nighttime. In the daytime, the light colour reflects the sun and looks appropriate (as much as a suit can in Jamaica) for the tropical weather. Because this suit is made of a mohair blend and thus has some sheen, it transitions well into the evening scenes at the club while the light colour gives Bond a more relaxed look than a dark suit would have. The white shirt also helps the suit transition into evening. Even though a mohair blend is perfect for the setting, Bond is likely also wearing mohair because it was very popular in the 1960s. 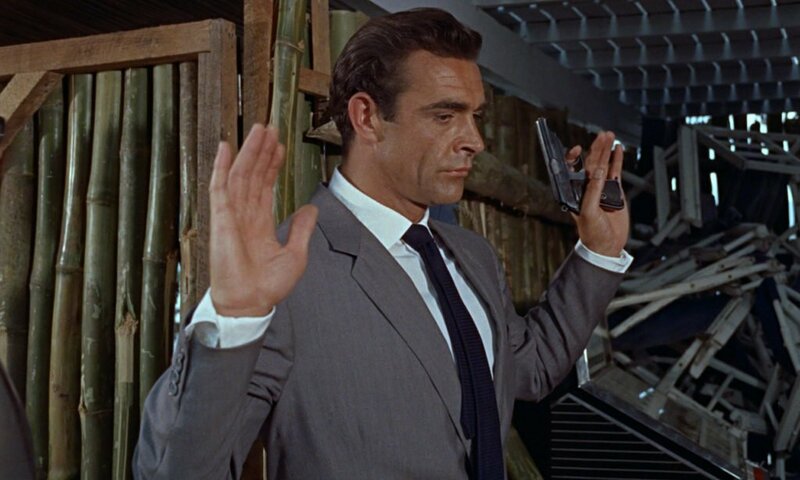 Though Sean Connery’s Bond does not let fashion trends dictate the styles of suits he wears, he still takes inspiration from popular trends. This light grey mohair and wool two-piece suit is one of three lounge suits that tailor Anthony Sinclair made for Dr. No, and it follows the same style as the other two suits that James Bond wears in the film. 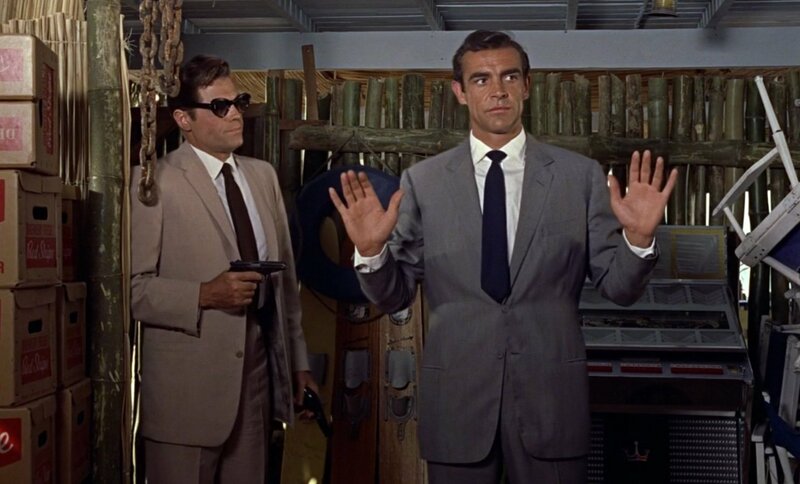 Despite Bond telling Felix Leiter that this suit was fitted by his tailor on Savile Row, Sinclair was in reality located a block from Savile Row on Conduit Street, which intersects Savile Row. Sinclair’s style was not a whole lot different from that of his neighbours on Savile Row and used subtle aspects from the equestrian, military and drape tailors on the Row. 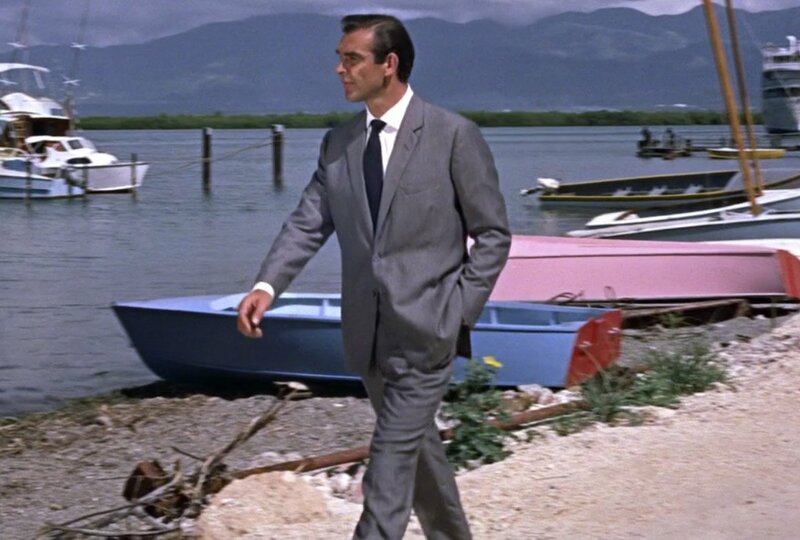 The suit jacket follows the same style as the other suit jackets in Dr. No, with a modern button two front with the top button at the natural waist. The lapels are a medium-narrow width, giving a subtle nod to the narrow-lapelled fashions at the time. 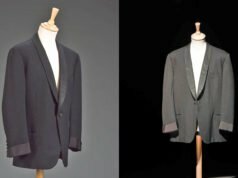 The jacket is cut with soft shoulders, roped sleeve heads, a full chest and a gently suppressed waist, giving the suit a classic English silhouette. The chest has a bit of drape, which helps Bond to conceal his Walther PPK inside the jacket. The jacket has double vents, straight jetted hip pockets (without flaps), a low welt breast pocket and four buttons on each cuff. The buttons are light grey plastic to match the colour of the suit. The suit trousers have a traditional English cut with a high rise to the natural waist and double forward (inward-facing) pleats. The trousers legs taper to a moderately narrow hem with turn-ups. The waistband has an extension with a hidden hook, and on each side there are button-tab side adjusters with three buttons. 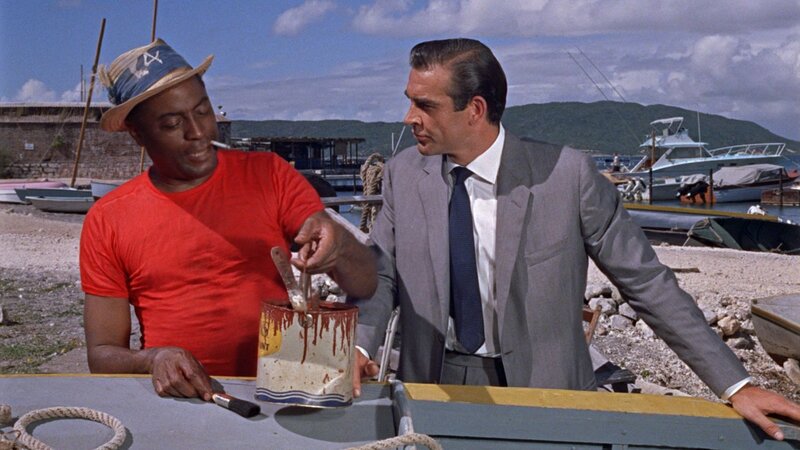 Bond’s shirt is a soft white Sea Island cotton poplin from Turnbull & Asser. The fabric is very lightweight and breathes well in Jamaica’s hot weather. The shirt’s collar is a cutaway with 1/4-inch stitching that is similar to the Regent collar they make today, but they made a bespoke collar for Sean Connery. The shirt follows typical Jermyn Street style with a narrow placket stitched 3/8 inch from the edge and no front pocket. The cuffs are Connery’s Bond’s standard cocktail cuffs, with a rounded shape. 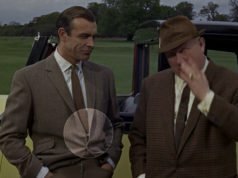 With this suit, as with the others in the film, Bond wears a dark navy blue grenadine tie from Turnbull & Asser, which has a moderately narrow width of about 7 1/2 cm. In the outdoor scenes we can see the outlines of the ties’ folds under the tips of the blades, signifying that Connery’s grenadine tie is untipped. Such ties usually are finished with hand-rolled edges, and this tie most likely still has the traditional three-fold construction with a lining inside. Since the tie’s knot is small, the tie likely has a very lightweight lining. He ties it with a Windsor knot, which is Sean Connery’s preferred knot. Bond’s shoes are black calf three-eyelet cap-toe derbys on a pointed last, possibly made by bespoke shoemaker John Lobb Ltd.
Is Tasmanian wool from loro piana made for hot weather as well? Yes, it is very lightweight wool, but it does not perform as well as mohair. Haha I wondered if you’d be profiling this suit as I was watching Dr. No (again!) on the TV last night. I’m surprised you didn’t include a screen shot of Connery in his hotel room getting ready to meet Strangways’ friends at the club, as we get a good look at the strides sans jacket to reveal the rise, waistband etc. Anyway, this is one of my favourite suits in the canon. Matt I wonder how much it differs, if at all, from the silver grey mohair he wore in Thunderball getting ready for the Junkanoo with Fiona Volpe? Never mind about the trousers – that was the glen check suit not the mohair, right? Yes, that’s the glen check suit. Thanks for the article Matt, I always loved this timeless suit with timeless details all in a perfect cut. I think it really is appropriate for a suit like this for the warm summer months these days and especially in the tropics. 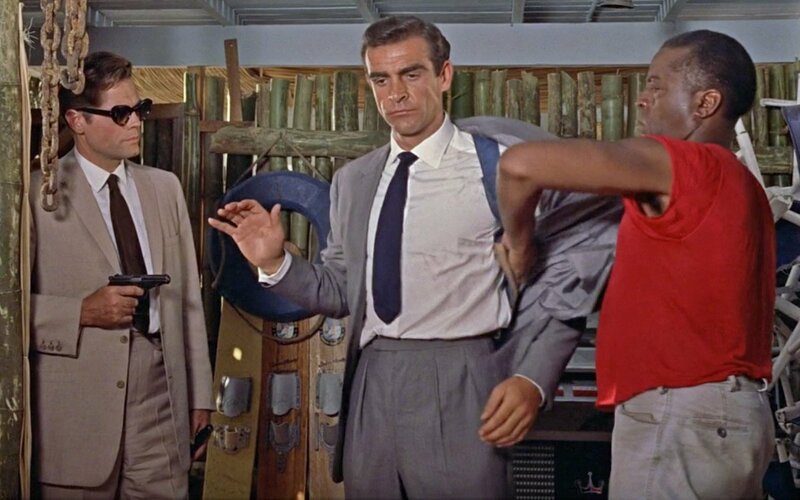 Is the white shirt Bond wears here one of the few times Connery has worn a solid white shirt with his lounge suits, besides the subtle striped white shirt in Goldfinger and are these the only times Connery wears a white shirt with lounge suits. When is a suit ready to be exterminated? You don’t say Panacek…..let me guess you are a fan of the three suits, three shirts , three neckties for 300 dollars? My mistake, I thought you said “extinguished” for some reason. Do you mean retire a suit, like when it’s been worn too much? IMO it is vice versa: I prefer the Dr. No shape of lapel because it is more on the classic side, whereas the DAF ones are a bit too wide (already pointing a bit towards 70s fashion). And to my eye, the DAF suits’ jackets are a bit out of balance because of the rather low buttoning point. 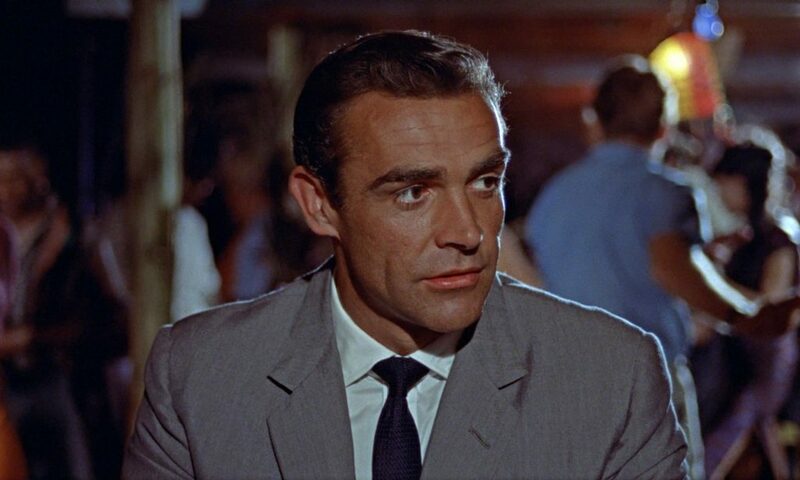 With Dr. No, it’s not the lapel width, which is actually fine and classic in proportion but rather the shape in the area of the gorge part of the lapel. 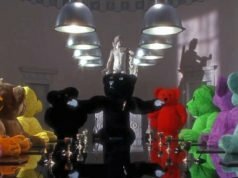 It strikes my eye and seems out of sync with Sinclair’s cut in the later movies. Just not as aesthetically pleasing as the suits in Connery’s other movies. With YOLT, it’s a different issue in relation to the fit of the suits. As for DAF, well, I’m just more predisposed to lapels which err on the wider than narrower side, lower button stance, deep vents and slanted pockets. For me, sartorial perfection! I see your point David and I definetly respect your opinion.